After two years of collecting dust, the sewing machine my mother in law got us as a Christmas gift was finally unpackaged and test out! My Aunt Christine was down for ScrapFest 2013 the other weekend, so I took advantage of hosting her for the weekend to quiz her on the ins and outs of using a sewing machine. You can categorize me as "little to no experience" when it comes to sewing, I really was not even sure where to start. My aunt quickly realized this when she got a look at the random spools of thread I bought from Michaels that week. Not at all the correct type...who knew! For my first project, I set my sights on a Grandin Road decoration I had spied months earlier. This catalog is a Halloween junkie's dream, with life size yard sculptures, elaborate costumes and all the makings of a great haunted house. The mantel scarf stood out to me because I have struggled in creating a real "scene" on my fireplace mantel, as opposed to just setting a bunch of random things atop it. With a little more flair and color on the sides, perhaps the job would get easier. Halloween is Christine's favorite holiday, and she has the fabrics, rubber stamp collection and crafty kits to back it up. She brought a stack of skulls n' bats fabrics down for us to try our homemade mantel scarf out on. 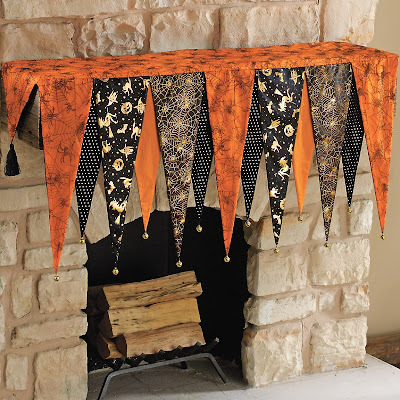 The fireplace mantel measures 50 inches across, so we decided to make 2 sized pennant templates - one at 6" wide and 15" long, one at 4 1/2" wide and 12" long. A cut up paper bag sufficed for our template. After ironing the fabric, we got to work cutting triangles, making sure to leave about a quarter inch on all sides to allow for the seam without losing our intended length and width. After determining how many of each fabric we'd need, we cut the same amount out in plain black fabric for the backside of each pennant. The two sides were placed front side facing each other, pins were placed to match up the lines and it was run through the sewing machine leaving an inch or two at the top to pull out the fabric and shape back into a pennant. You might use a knitting needle or something similar to fully poke out the corners. What did I have handy? A lollipop stick leftover from the Great Pie Pop Experiment of 2012. After finishing up the pennants, I arranged them in a few different ways until I had an flow that seemed to mix the fabric styles the perfect way. I did not both sewing up the edges of the pennants as I knew the tops would be covered up eventually with a connecting fabric runner. Speaking of the fabric runner, I was a little torn on what to do. By this time, my aunt had waved goodbye and headed back home. I was easily able to recreate the cutting and sewing of a couple dozen pennants, but I was not quite sure the steps to bring them all together. We headed to Joann Fabrics where I picked out some more fabric - not quite solid colors, but simple stripes and polka dots to allow it to blend in with all of the other styles easily. I knew the mantel was 50" wide, so figured I'd get at least 5 feet of fabric to have plenty extra. Well, I should have paid more attention during the cutting because when I got home I only had about 44 inches of each! This added the extra step of sewing an end cap onto each side with the opposite fabric. I cut out and sewed up two identical pieces, giving it about 10 inches of depth to allow it to hang easily from the mantel without falling forward easily. This isn't the full depth of the fireplace top (which in all honesty is not actually a "mantel" at all), but I typically fill the top with fake leaves or other decor to fill in the white space. I ran three sides of the panels through the machine and turned it inside out. So far so good. I took a quick break from the machine to press the pennants with an iron. Amazing how clean a look that creates with a couple short passes of the iron. Also how flat they get - check out these two stacks that have about the same number in each pile! After pinning the pennants in the order I wanted, this is where things got a little complicated. I started off well, but keeping everything in place proved a bit difficult and I had a couple mishaps where a pennant got missed completely. I painstakingly removed a few inches of stitched thread, only to mess up again. Then I forgot the fact that just because I'm sewing on the underside of the banner, this doesn't mean the stitching won't show through the front. Oops. I did have the "stripe" on the fabric to follow which helped me keep things straight, for the most part. I think the next time I'll do it I will figure out if I can get the seam on the inside like I did with the pennants. There has to be a way! Now that I've got the sewing bug, what else should I attempt? After cancellation of our March craftapalooza, my aunt, sister and I finally re-grouped this past Friday for ScrapFest 2013. I had already been planning on taking the 19th off for a personal day and asked my aunt and sister if they might be free to play hooky for the day and come down to my place. BYOS: Bring Your Own Stamps. 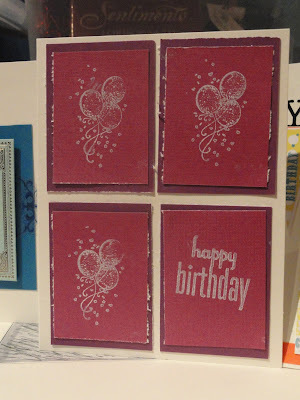 Also check out the post from our 2012 event and the cards and scrapbook pages created that day. After fighting through construction traffic and two blocks of parking sealed off for street sweeping (here's where city living gets less fun), they finally unloaded their goodies and we set up in the craft room. My Aunt Christine focused on making a few Halloween themed tags for her October craft fair. My sister was catching up on scrapbook pages for my niece. I decided to replenish my supply of birthday cards - I had run out awhile back and found myself in the Hallmark aisle of Walgreens a little too often lately. First up, a quick snapshot of Christine's tags. Halloween is her favorite holiday and the vintage decorations, stickers and rubber stamps are never in short supply at her house. My sister tackled five autumnal themed scrapbook pages featuring Miss Ella through the years. 2 costumes, 1 pumpkin patch and 1 goat farm later and she was spent. It was a little slow going at first, but by the end of the day had 17 new cards to choose from for future well wishing. Most are birthday themed. This one benefitted from my horribly dull paper cutter to give the edges of the cardstock a frayed look. This card was made with decorative tape, stamps and two sizes of square punches. Decorative tape, aka fake washi, is my new favorite. I had to stop myself from buying them out at Michaels when half the rack was on clearance. I picked up a pack of money/gift card holders at Michaels that had super cute designs and sayings like, "Top Secret." "Show me the Money," and "Good Fortune is Found Within." This one that says, "Your Ship Has Come In" steals an idea off of the back of the packaging by using blue paper and ribbon to create an ocean-like background. A set of whimsical images like bicycles and butterflies on thin plastic helped create a few more cards. 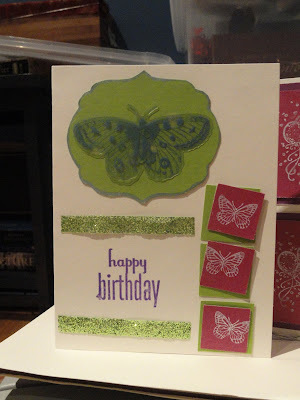 This butterfly one shared the page with a white-inked butterfly stamp I had on hand. And I experimented a little with a bit of gauzy overlay attached with glue dots. This photo makes it look like it is hanging down, but it is just a strange shadow! 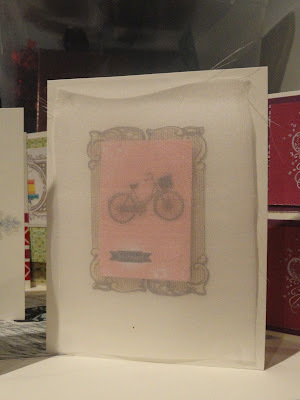 The bike image was glued to a pink rectangle that had "birthday" pre-printed in small letters within a bottom banner. I used two brown banners next to each other as a background. Once I got a little tired of using the birthday stamps, I turned to makin' baby cards. I'm pretty sure the "baby love" decor was table confetti from a long ago baby shower. I must have swept it into my purse expecting it to come in handy someday for a project! The girl card features a footprint stamp in pink and a piece of lace attached to a dotted scrap of paper. A few other cards were directly inspired by Pinterest posts, so I shall save them for another day. Also saved is the other reason for Craft Day: so I could learn how to use my sewing machine! I tackled a rather intensive project for my first go, and must say am very happy with the result. Here's a hint: Halloween was definitely the theme of the day! Last month, we made a quick weekend trip up north to see the folks and spend some time on the lake I grew up on. 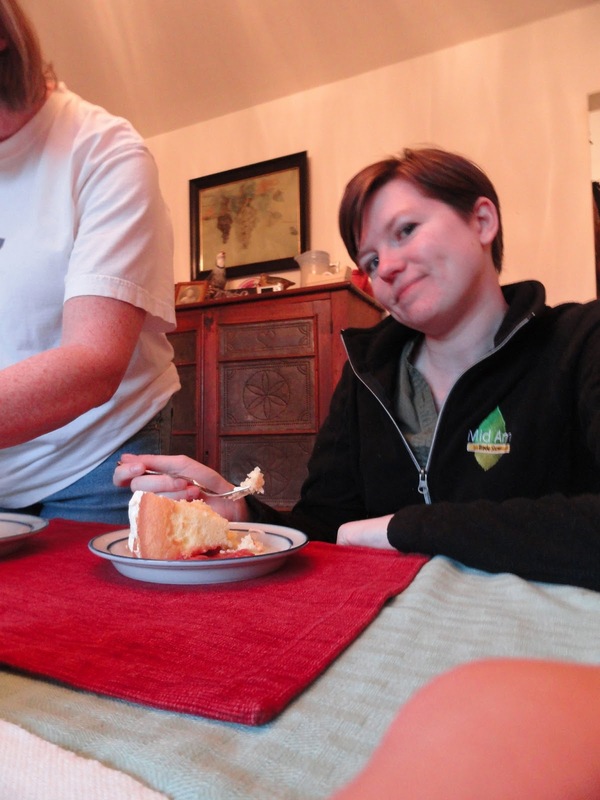 As always, my mother put on quite a feast with each meal opportunity. 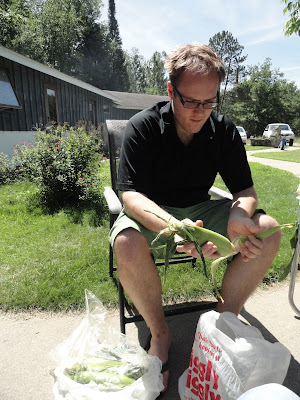 The perfect weather lent itself well to grilling out, as we helped shuck corn and baste ribs without having to move from our lawn chair seats. The ribs were easy enough, with a simple BBQ sauce slathered on top. 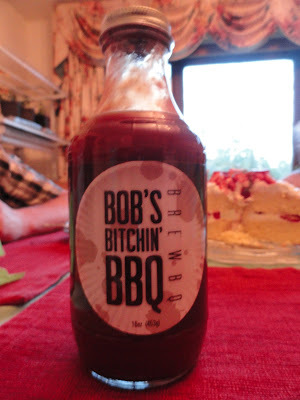 Now, unfortunately it was not the BBQ sauce I would receive later that evening as a birthday gift! Made with Wisconsin's own Spotted Cow, just for the husband, this "BrewBQ!" The shrimp were de-veined, de-tailed and skewered before taking their turn with a few minutes on the grill. There are several variations of mint pesto on the world wide web, this Bobby Flay one features a lemony zest and flavor that is never too heavy on the basil. Combine mint through lemon zest in food processor and pulse until smooth. Add olive oil while machine is running until smooth. Season with salt and pepper. The watermelon salsa was a refreshing something on the side. Diced watermelon, cucumber, cilantro and red onion mixed with a bit of lemon juice was all it took. She also added in a little diced red pepper for added color and flavor. Cut to a week later and us needing a meal idea as we hosted Bob's family for the Fourth. Hey, what about grilled shrimp with a mint pesto? And a side of watermelon salsa? How original! I had not grabbed the actual recipes my mother used, but a few internet searches and our foggy memory sufficed to recreate as best we could! I briefly mentioned my birthday so I better not forget about the cake! Mom had made a two-decker strawberry and cream filled confection. A couple years back I wrote a post about modern design store inspiration. 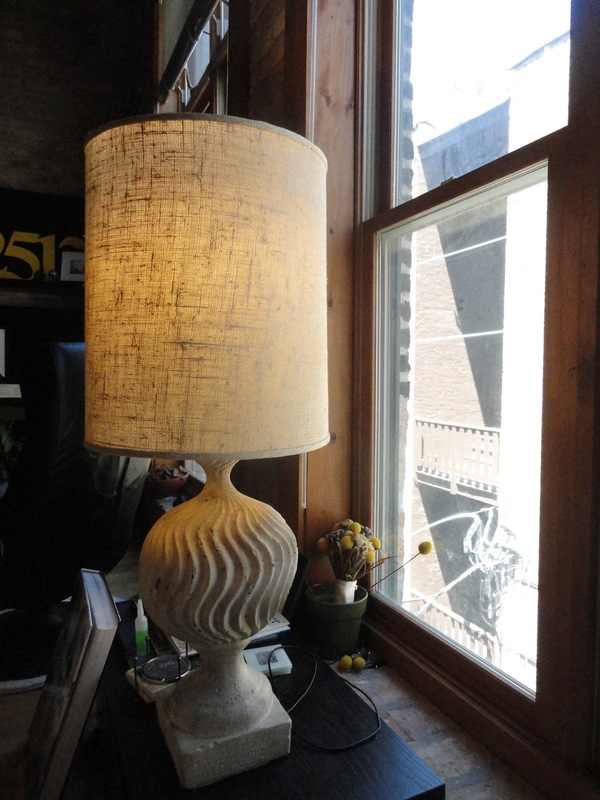 Bob and I took a walk through the Chicago stores that offered a little something different in the way of furniture, albeit typically with a price tag to match. On the trip, we ended up finding the dining room table of our dreams. Cut to one year later: we had pulled the trigger and placed an order. 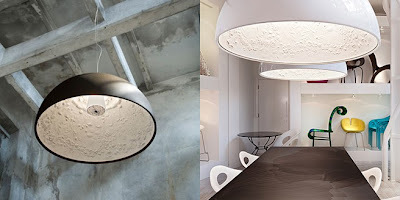 1) The ceilings are so high in the dining area that we have never been able to reach the tracklights above our table. You might ask, "can't you just get one of those handy dandy poles that allows you to screw lightbulbs in?" The answer is, "We wish." The tracks the bulbs are placed on aren't simply screwed in, but need to be manhandled through a plastic rim to snap into place. I fear for Bob's life when he is up on that ladder. 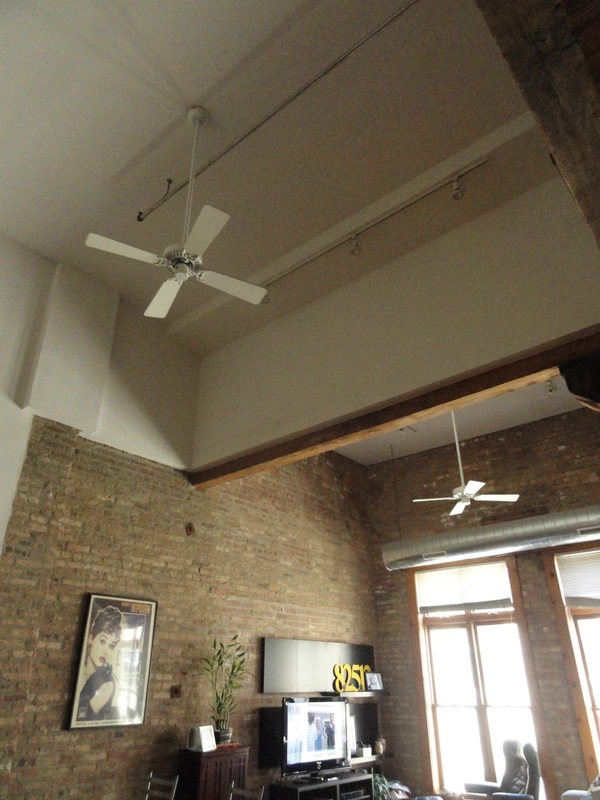 So the plan is to remove those track lights and ceiling fan and replace with a statement piece pendant of some sort. 2) The fan above the living room gives off a terrible clicking sound. 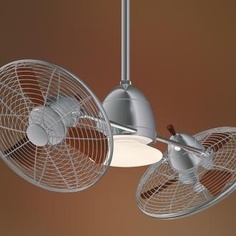 We'd like to replace it with the Minka Aire Gyro Twin Fan we found online around the time we moved into our place. Saving up our Amazon gift cards from various credit card rewards for this one. 3) If the lights and fan are both on, our bedroom turns into a horror movie set as the fan passes through the light streams, causing a pseudo-strobe light effect. 4) We wait until at least three lights are out before we deem it worth the effort to get the ladder out. Step 1: Grab the tall ladder from the building's stairwell. Step 2: Maneuver it through the hallways and angle it into our apartment. Step 3: Re-learn how to unfurl the legs and manage to get it to stand up right. 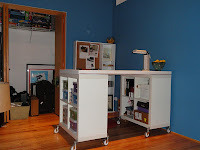 Step 4: Move all of our furniture around to make room for the ladder. Step 5: Remove old light bulb and place on counter. Step 6: Forget which one was the new light bulb. Step 7: Jam the bulb back into place (seriously, this track light design will be the death of us). Step 8: Don't die while climbing back down the ladder. Step 9: Stare at the ladder and hope it will put itself back in the stairwell. To lessen the harsh overhead we deal with (even with a dimmer, it can be a bit glaring), we have added a little bit of lamplight to our living area in recent weeks. This guy, inherited from Bob's uncle and dubbed "The Concrete Lamp", had moved with us four times before it earned a spot outside of the closet or storage area. The shade and base were intact, but we were missing a piece to sit the shade on the base. A quick trip to a lamp supply store just a few miles away finally solved our problem. The purchase of a glass cone for the shade to sit on gave us a little bit of a Mad Men vibe alongside our couch. Okay, onto the inspiration. First up, Circa. The Eugene Pendant Light caught our eye - the brushed nickel and industrial look seemed like a natural fit for our loft. We could easily picture three hanging down in a row over our dining room table. One of the must-haves for our lighting and fan options will be flexibility with how far the wiring/cables will reach. We're looking to hang these in the tallest parts of our house and need to know the fixtures won't look out of place hanging down so low. The next stop was Artemide. Bob had perused this place the previous week and brought home a stack of information including sell sheets and catalogs. He prefers the IN-EI Collection by Issey Miyake, specifically the Fukurou. I agree that it could definitely start some conversations, but try as I might, I just don't think it is my style. 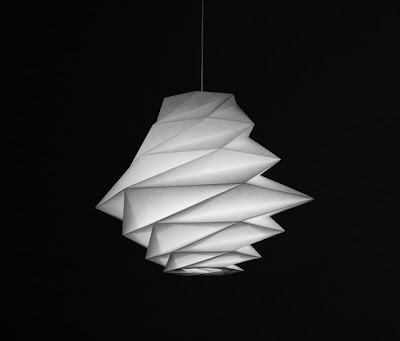 I have never been a fan of the "paper" look in lamps. Granted, this is much more than your average World Market lampshade, but it still wasn't speaking to me. We'll see if I come around on it! However, one we both agreed on was the Ernesto Gismondi Nur. 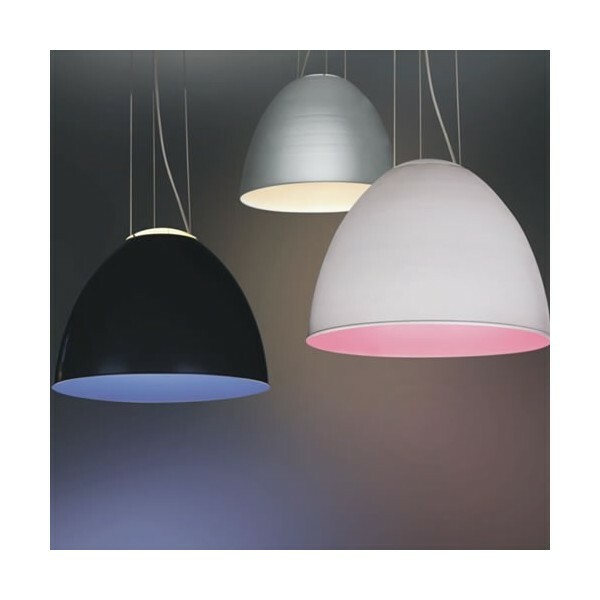 Available in three sizes and three colors, we are thinking two medium or three small above the dining room table. My question is, can we get away with two fixtures, or do we need to follow the "things are better in three's" rule of design? 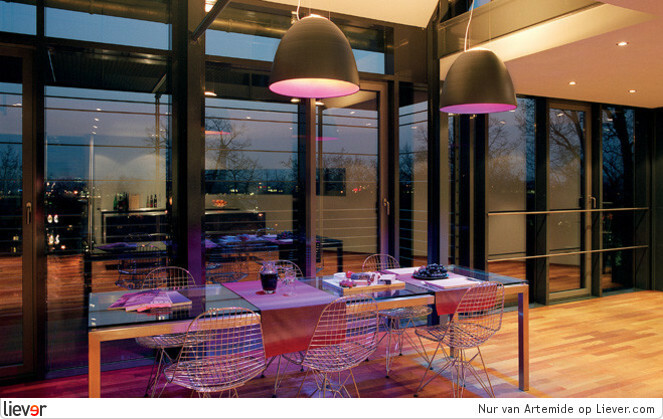 The images I have been finding on a google search of the Nur in actual rooms leads me to believe the answer is yes. 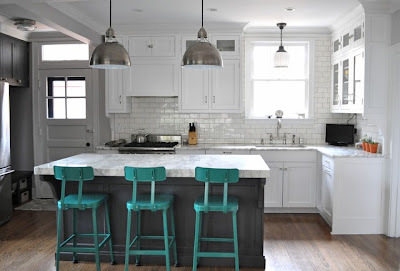 Another option would be to put a third one above the kitchen island. After Artemide, we wandered through Luminaire. Although our attentions turned to chairs after spying a unique piece that I'll detail shortly, this pendant also caught our eye. The Skygarden light has a cut plaster interior shaped into a garden scene, something you wouldn't see unless looking up into it. But what we found ourselves drawn to at Luminaire had nothing to with lighting. Right as we walked in, these dining room chairs begged us to sit down (yes, we're still looking for dining room chairs). 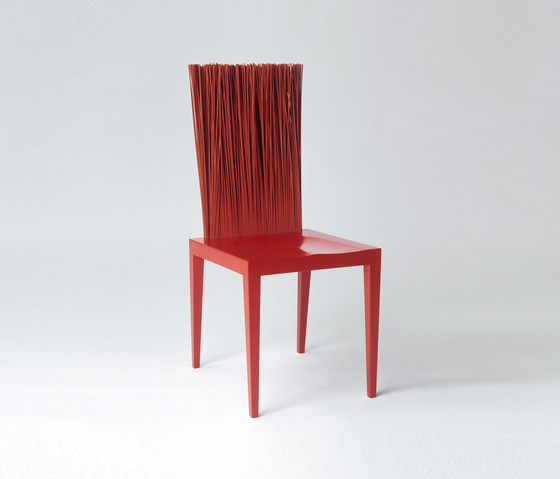 The Jenette by Fernando & Humberto Campana features a backrest made of thin stalks of flexible PVC. You might be thinking, "wait, what?" But hidden support within the material actually makes this quite the comfortable seat. These would be cool statement pieces, but I also had visions of a two-year old grabbing one of the stems and bending down until it broke off or became frozen at a forever misshapen angle. The Juno chairs seemed a little more realistic for our lifestyle (and wallets). 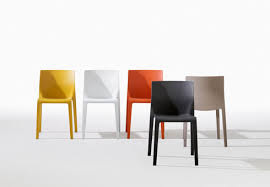 These plastic chairs come in orange, one of the colors we would be interested in for our set of 6. The truth is, we want hot pink chairs. But that color is few and far between in the styles we look at, so orange may end up being our compromise. 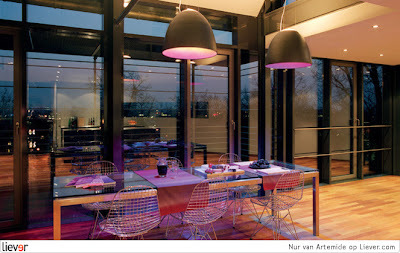 We have been surprising quite a few furniture store sales reps with a request for hot pink chairs over the last year! Another round of inspiration under our belts, time will tell with what styles we settle on! When you stop and think about how many free activities you don't take advantage of in your hometown, it can get a little humbling. Heck, I always kick myself for not going to enough Broadway in Chicago shows, live music and museum activities and those all fall in the category of shelling out money! So when Bob sent me a gchat about the upcoming movie in the park schedule I jumped quickly to say yes. We packed a picnic and grabbed a spot, ready to watch Skyfall on a Saturday night. I had visions of the show Parks and Recreation and half expected Leslie Knope to come out from behind a tree and welcome us to the free event. We have gotten some good use out of a picnic set we received as a wedding gift. Funny story, I thought it was just a nice cooler until a week or so after receiving it. Noting how heavy it seemed to be (I chalked it up to a freezable ice pack somewhere inside of the cooler), I unzipped the side and found a 4 piece picnic set! Who knew! The cooler was filled with individual containers of salsa we could easily hold, cheese, sandwich fixings, pasta salads and a few libations. We picked up some good sub bread, crackers and other snack snacks to fill the dry goods basket. Over the years, we have had several, "Dammit!" moments when we realized we forgot a crucial part of our picnic at home. Usually a corkscrew or cups or something along those lines. So I was pleased to find we didn't find ourselves without on this go round! - Long pants/fleece or jacket/socks - seriously, I can't believe people are still tooling around in short shorts at 10pm at these things! We covered dinner, now onto the movie....we had some free entertainment in watching the guys attempt to set up the inflatable movie screen. It fell back on itself a few times before they figured out the magic formula for getting it to stand upright. Did I mention this was the first weekend of Movies in the Park for the summer? I'll go ahead and give them the benefit of the doubt that they have gotten the process down by now! The evening was going well, until the rain clouds we had been tracking all day finally hit us. As we anticipated, at 10:30pm the skies opened up and we all had to pack it in, right as Javier Bardem was making an impassioned speech in his prison cell. Maybe next time we'll stay with clear skies through the end credits. The boys enjoy when we are getting ready to go on a picnic because it means a new blanket laid out on the floor for them to nap on.